My friend Harry Abbott has returned to Spain after a long journey which took in some fishing in Thailand and New Zealand. He told me that yesterday, while I was trying to stuff some understanding of Science in to unreceptive brains of indifferent teenagers, he popped off to the river to see if he could catch a few fish. The river, he tells me, was heaving with fish and that he had become particularly well acquainted some of them. 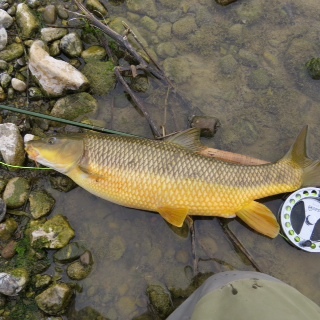 I attach below a photo of a lovely gypsy barbel he caught and returned. I am looking forward to joining him on the river tomorrow and to hear a little more about his fishing adventures overseas.